Originally spread over seven hills, or jabals, the capital of the Hashemite kingdom now sprawls over 19 hills and is home to over a million people, almost half of Jordan's population. 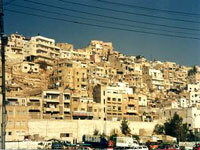 Known as the White City, the hills are covered in a jumble of light-coloured stone houses, consistently box-like in shape with flat roofs characteristic of a typical desert city. Faded minarets, pavement markets, Arabian sweet shops and the crumbling remains of ancient civilisations contrast wonderfully with the contemporary edifices, fashionable boutiques and international restaurants. This blend of the old and the new combines in the noisy and chaotic downtown area where the city's extraordinarily friendly residents go about their business. At the heart of downtown is the Ottoman-style King Hussein Mosque, around which the buzz and bustle is at its most interesting. Even busier at prayer times, the surrounding streets are filled with the essence of Arabia, exotic smells and rows of glittering treasures in the souq (market) amid the noise of frenetic haggling. Just as overwhelming is Amman's sense of history, dating back 5,500 years to its position as the ancient capital of the Ammonites, Rabbath-Ammon of the Old Testament, and later as Philadelphia, the Roman city that became part of the Decapolis. Overlooking the city from atop Jabal al-Qala'a is the Citadel, the site of the ancient Rabbath-Ammon, and at its foot lies the impressive Roman amphitheatre that is the most remarkable remnant of ancient Philadelphia. Amman is one of the oldest, continuously inhabited cities in the world, and today functions as a thriving commercial and administrative centre with modern facilities, historical attractions and a longstanding tradition of hospitality. It is an excellent base from which to explore the surrounds, even the rest of the country as its no more than five hours drive from anywhere, and is surprisingly agreeable for a capital city.